BANGKOK -- Thai police on Wednesday issued an arrest warrant for a suspected bomber who is being hunted as part of the investigation into the Monday explosion that killed 20 people at a downtown Bangkok shrine. They also said that he did not act alone. National chief of police Somyot Poompanmoung said "he didn't do it alone for sure. It's a network." Investigators believe a man seen in security video wearing a yellow T-shirt and carrying a backpack set off the explosion. Police released several photos of the man, with and without the backpack, as well as a detailed sketch, and asked the public to provide information about him. Charges against him include conspiracy to commit pre-meditated murder, as well as charges relating to the posession of unauthorized explosives and weapons. Police also announced Wednesday that two other men seen in the security footage are suspects. "The person in red and the person in white are also suspects," police spokesman Prawut Thawornsiri said in a televised interview, according to the Reuters news agency. Thai police offered a reward for information on bombing suspects. 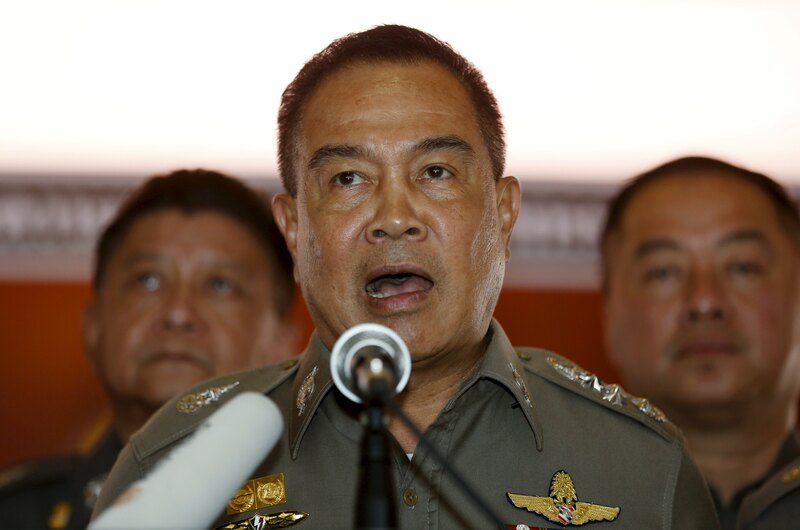 Police spokesman Lt. Gen. Prawut Thavornsiri said in a tweet that 1 million baht - the equivalent to $28,080 - is being offered for any word on the bomber or bombers suspected of planting the explosive device. Thai Prime Minister Prayuth Chan-ocha appealed to the suspect to surrender, because "he might get killed to stop him from talking." "If the person wants to be safe, he should turn himself in. Officials will find a legal way to provide him with safety. It's better than living in hiding. It would make his life miserable," Prayuth told reporters on Wednesday. The U.S. Embassy in Bangkok said it has not received reports of any Americans being affected by the bombing. "We continue to liaise with local authorities and healthcare providers to determine whether any U.S. citizens may have been affected by the explosion," an embassy official said in a statement. Meanwhile, the shrine that was the scene of Monday's deadly attack reopened to the public on Wednesday. A teary-eyed, young Singaporean who lost his mother in Monday's bombing as well as relatives of four members of a single Malaysian family who died in the blast were among those who offered prayers and incense sticks at the Erawan shrine. The relatives were led by a dozen Buddhist monks who performed a ritual. The remains of the four Malaysians are scheduled to be returned to their hometown in Penang state later Wednesday. They were traveling on holiday in Bangkok in a group of seven. Lee Tiang Heng, the grandfather of the 4-year-old Lee Jing Sian, who was among the dead, told Malaysia's New Strait Times daily newspaper that "the whole family is devastated with the news and we are finding it hard to come to terms with their deaths." Malaysia's Deputy Foreign Affairs Minister Reezal Merican Naina Merican said the bombing was a "heinous ... unforgivable crime" and called on Thai authorities to expedite the investigation. Bangkok has seen politically charged violence over the past decade; the deadliest, in 2010, killed more than 90 over two months and was centered on the same intersection where Monday's bomb went off. But none of those attacks included a bomb blast that seemed intended to produce mass casualties. The city has been relatively peaceful since a military coup ousted a civilian government in May last year after several months of sometimes violent political protests against the previous government.